Stuck in a full-time job but want to write a novel instead? Wondering how you’ll ever find time for your personal projects when you have so much on your plate? Thinking about trying to tackle National Novel Writing Month (#NaNoWriMo) this November, but worried you can’t write that many words or your novel will end up being terrible? If you need more time and more energy, ask yourself this question: What would doubling your writing speed do for you? And what if you could learn how to do it in a single weekend? Back when I was in my early 20’s, I desperately wanted to be a full-time fiction author, but couldn’t figure out how to make it happen. From 2009-2013, I wrote five not-very-good novels in my spare time while working 60+ hours a week, first as the marketing director at a series of startups, then as a freelance marketing, copywriting, and strategy consultant. It was a lot to handle all at once, and frankly I was failing at all of it! I found myself working harder and harder for not many results. It took me an entire year to write a book and I barely had the energy to sit down and write after dealing with my job, my bills, my dwindling bank account, and my personal life. 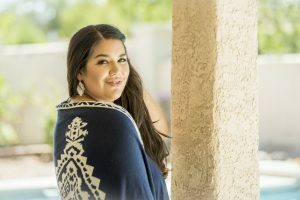 On the business front, I was stuck in a cycle of feast or famine with finding clients, which left me in a high stress and desperation mode a lot of the time. By the end of 2013, I had been trying to become a full-time author for five years and hadn’t gotten much closer than when I started. In the meantime, I’d spent around $30,000 trying to figure it out, and making tons of costly mistakes. I couldn’t dig myself out of my situation. In fact, it felt like I was really just digging a grave where my creative career dreams could go to die! I knew that if I could get either money or time, I would have just enough leverage to escape my pattern of being broke + never having enough clients + never having time to get my personal creative projects off the ground. I was eventually able to quadruple my writing speed, and it didn’t take me very long to figure it out—just a few weeks, actually! Once I did this, the floodgates opened up. I was able to raise my freelance rates while at the same time lowering my time spent on freelancing. I was also able to complete my personal projects much faster and went on to write about a book every 1-2 months, starting in 2014! The thing that changed everything for me was in September of 2013 when I forced myself to write 50,000 words a month. I really just wanted to prove to myself that I could take my own dreams seriously. If I didn’t make it happen, I was going to quit! When I crossed that mark on September 30th, I felt shocked. 50,000 words—it was possible. Not only was it possible… It was possible for me! So I decided to try again October of 2013. I hit 50,000 words that month, too! I hear you, and I can tell you that writing faster is one of the skills that took me very little time to learn, but has paid off dividends and changed my life completely in just a few years. Step #1: You have to know what you are going to write before you write it. I learned that if I prepped my novel ideas by taking it through a sound and simple storytelling framework, I could write 50,000 words of a novel in less than a month. Sometimes in less than a few weeks! More importantly, I wasn’t just writing some junk novel that would die on my hard drive. I was writing a good novel—one that was workable, editable, and worthy of readers, agents, and publishers. This simple set of prompts to plan your novel (30 of them total) was my best-kept secret to writing high-quality first drafts of novels quickly. In fact, I’ve used this 30-day novel planner to publish 16 novels and novellas under two pen names. I even hit the USA Today bestseller list with one of them! 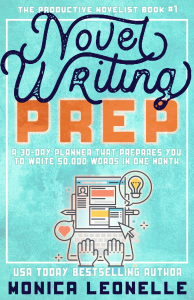 If you’re interested in grabbing this 30-day novel planner so you can prepare to write 50,000 words of your novel (or next novel) in a single month, I highly encourage you to check out Novel Writing Prep: A 30-Day Planner That Prepares You To Write 50,000 Words in One Month. It’s the first book in The Productive Novelist series, and I think you’ll love how simple these prompts are. Planning out my novel using these simple prompts literally doubled my writing speed overnight. It was awesome! In the book, I also provide you with some modern storytelling examples from books you’ll have heard of (Harry Potter, Twilight, The Hunger Games, The Martian, The Fault in Our Stars) and some key mindset tips for getting through a 50,000 word month—whether you’re doing #NaNoWriMo or working on your own! Like I said, I quadrupled my writing speed, going from about 700-900 words per hour to 3500+ words per hour. I share my full 4-step process (you already know the first step: know what you are going to write before you write it) in the second book in The Productive Novelist series called The 8-Minute Writing Habit for Novelists: Triple Your Writing Speed and Learn Dictation to Produce More Words, Faster. Check out the description to see if my system might work for you! « Should You Set Up an Amazon Pre-Order or Not?